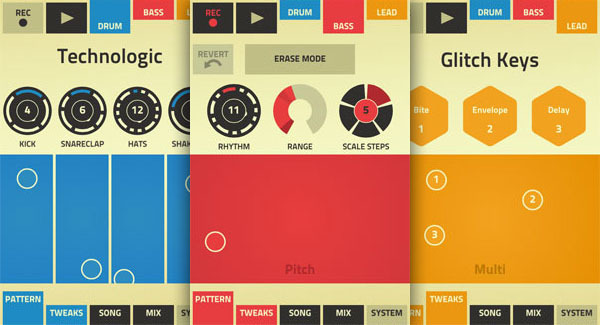 Propellerhead‘s long-awaited iOS application, Figure, hit the market a couple months back to rave reviews from the public and media for its expressive playability in a very streamlined form. The app offers a limited number of key instruments (drums, synth, bass), each with a set of presets and a few parameters that can be tweaked. The instruments are mostly derived from Reason’s Thor synthesizer and sound very punchy and clean. The interface has been praised by blogs such as Wired magazine and Create Digital Music for its expressiveness. This month Propellerhead released Figure version 1.1, which now offers the ability to save, load and export songs as well as change the loop length. If you haven’t experienced Figure, it’s not an expensive investment at $.99. Camel Audio’s Alchemy Synth Mobile is a clever and downright wonderful re-creation of the company’s esteemed Alchemy virtual additive synthesizer, considered by many to be one of the best software synths on the market. Alchemy works as a standalone synthesizer and comes with an impressive pack of preset sounds to get started with. The interface functions offer a keyboard, sliders and x/y pads for control. The Sonic Touch podcast says the synth is “really lush, very nice and expressive.” This app has been built with an intelligent download and library structure where you can download the application for free (this version is limited in terms of functionality) and later upgrade to the Pro version for $14.99. In addition Camel Audio is offering preset libraries for $4.99 each. Wavemachine Labs Auria is a 48-track digital audio workstation designed exclusively for the iPad. It has been designed from the ground up to be used in professional recording situations, and “includes the necessary tools for recording, mixing, and editing any project.” We mentioned this application on our blog back in January when it was first announced, but we’ve been eagerly waiting to see the finished product as it promised to be a fully-functioning DAW production environment (currently the holy grail of iOS music production apps). While the asking price of $49.99 might be a bit more than we’re used to paying for iPad apps, Auria has been getting consistently good reviews for its intuitive interface, sound quality and extensive capabilities. The Pro Tools-like application offers a crisp graphic interface that looks like what you’d expect from a mixing console, as well as modern DAW additions such as a nice EQ interface and VST support (iOS VST format only). Maago is an exciting new tech startup from Italy that was founded by producers Marzio Aricò (aka Prudo) and Giulio Andreini (aka Scary Grant), both of whom wanted new control options for Traktor. “We have both been DJing and producing house and electronic music for many years, and started to develop DJ controllers because we were not satisfied with what was available on the market. We decided to design our first hardware prototype controller on our own, keeping in mind those professional DJs who prefer to perform with Traktor, but don’t like using multifunction buttons to access its internal features and/or relying on its internal mixer,” the duo explains. This mission culminated in the Maago 4×4 — an aluminum-cased USB controller that offers 20 knobs and 40 buttons to control a four-deck setup in Traktor Pro. Each of the four decks has a dedicated area that corresponds to the same area on Traktor’s computer interface. In a clever move, the company also launched Maago 4×4 Virtual to the world at the same time as the hardware release, offering the same layout and functions to iPad and iPhone users. 4×4 Virtual offers the same functionality of its hardware counterpart, with wireless control of four decks in Native Instruments’ Traktor Pro. The company offers thorough support for the app on their website, with .tsi setup files for Traktor and install instructions to get you up and running.